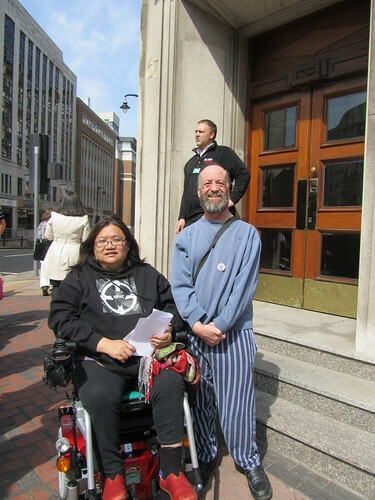 A lobby at the council house was held yesterday, called jointly by Disabled People Against Cuts (DPAC), Social Work Action Network (SWAN), UNISON Birmingham Council Branch, Right to Work and Birmingham Against the Cuts. 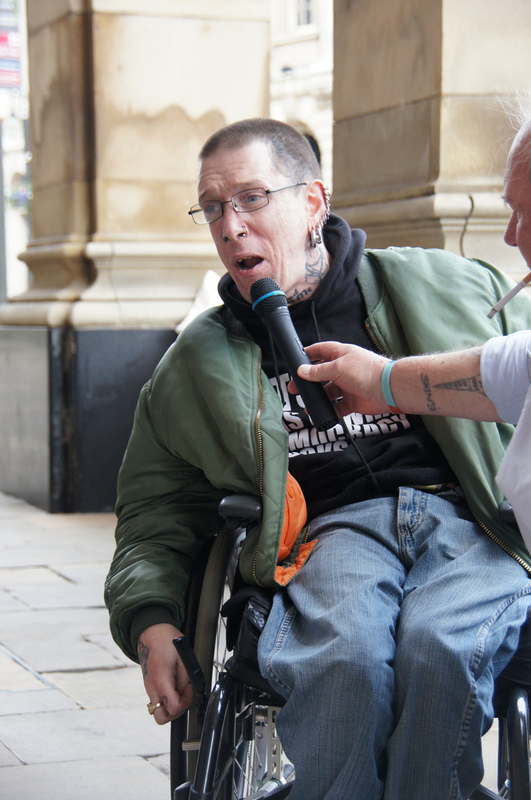 The five groups have come together this month to campaign on cuts to social and care services that the ConDem council are seeking to bring in, as part of the £212m council cuts. The council plans to cut back services to disabled people in particular, with care only being available to those adults judged to have “critical” needs. This means that adults with only “substantial” needs will no longer have access to care services. Originally the council said that this would affect 11,000 people, but have more recently said that it will only be 4,500 people who are affected – we, like Graeme Horn from UNISON, are inclined to believe the original figure as the council are likely to have tried to massage the numbers down following an outcry from the people of Birmingham about these horrendous cuts. Following the announcement of the cuts, a legal case was started which resulted in a judicial review in May that the cuts were unlawful, as the council had not done an equality impact assessment or consulted properly over the cuts. This review has forced the council to start a new consultation, which begins shortly. DPAC and SWAN decided to use July to campaign on this because the UN is currently monitoring the convention on the rights of disabled people – so at the same time the government is monitoring the report from the UN, they are cutting services to disabled people. They then contacted UNISON, Right to Work and Birmingham Against the Cuts to build a united campaign which can be effective in its resistance to these cuts. We have chosen to start the campaign now because of the court victory under the Disability Discrimination Act concerning the £33m cuts to care and support services. What we want to do coming out of that judgement is to build a campaign because Birmingham City Council will come back with proposals that we expect to be more or less the same and we need to build a campaign to fight these discriminatory cuts which kind of show who is really going to suffer – not the bankers who caused the crisis but disabled and vulnerable people. False Economy is a good website to start with to explore the alternatives to cuts, which broadly speaking encompass ideas such as closing the £120bn tax gap – especially the £25bn of tax avoided each year by wealthy individuals and large corporations; a robin hood and/or bankers bonus tax to ensure that the people and organisations that caused the crisis play their part in helping to get us out of it and investing in the economy (particularly in green manufacturing) to stimulate growth and prevent a double-dip recession which would cause tax revenues to fall, welfare payments to rise and the deficit to increase. He talked about the importance of linking up this struggle with the wider struggle against cuts, mentioning the Lib Dem conference in Birmingham in September, and the Tory conference in Manchester in October. There will be more events from this campaign this month, as well as ongoing work as we seek to prevent the council from cutting vital services. To steal SWAN’s slogan we want the budget to be based on peoples needs, not private greed. On Thursday (7th July) Birmingham Trades Council has its monthly meeting, at 7:30pm in the Council House. Bob Findlay-Williams from DPAC will be speaking. On the 20th July there will be a public meeting at Transport House on Broad Street (TGWU/UNITE building) with speakers from the groups and services affected by these cuts. Join the Facebook Event and invite your friends. Come along to these events and help the campaign to ensure that the consultation that the council are being forced to undertake is not a sham, and that vital services for vulnerable and disabled people are protected. Today DPAC’s Eleanor Lisney and Bob Williams-Findlay joined the PCS and Unite in the fight in Birmingham to save the Equality and Human Rights Commission at Lancaster House. Staff at the EHRC had voted overwhelmingly in favour 1 hour strikes over plans which would effectively close the Commission ending most of its advice services to the public and communities. The first day of action is a one-hour walkout is today 11am –12pm. The government has already announced it is withdrawing funding for the Commission’s helpline and grants programme and the Commission has also decided to close its regional offices, including the office based in Birmingham covering the West Midlands Region. These decisions will take effect by March 2012. The Commission is proposing to more than halve the number of staff from 460 to 200 within 12 months – PCS is calling on EHRC chair Trevor Phillips to reveal his plans for the future of the organisation, challenging him to define the ‘core functions’ which he claims will be protected. The government is currently consulting over the Commission’s future and is proposing to amend the Equality Act 2006 to strip the Commission of many of its key powers and duties. When the Commission was formed in 2007 its budget was £70 million. This was later reduced to £60 million, then £53 million by the new government last year. The government now wants to cut funding down to £22.5 million by 2015. Cuts on this scale would mean employers and public authorities would no longer be held to account if they carried out discriminatory policies, and would also effectively end the commission’s legal work – a recent example of which ensured six million carers in Britain are protected against discrimination in employment. PCS general secretary Mark Serwotka said: “Our members are experts in their fields and this strike vote shows they are prepared to fight to maintain a proper national equality and human rights body at a time when government cuts are making it more likely people will face discrimination and disadvantage. write to Theresa May MP, Minister for Women and Equality and other Minsters you or your organisation may have close links with asking them to maintain the EHRC functions servicing the communities. Sign the petition http://www.gopetition.com/petition/43944.html. Please sign the online petition against EHRC cuts and ask your friends & family to sign. There was also a demo/rally later with UNISON for CONNEXIONS workers. The rally was addressed by Graeme Horn, Birmingham UNISON Branch Secretary, Jagdish Singh a PCS representative from the Equality and Human Rights Commission who were today also on strike opposing 68% cuts in their service and the Birmingham City Council Labour group leader, Sir Albert Bore.